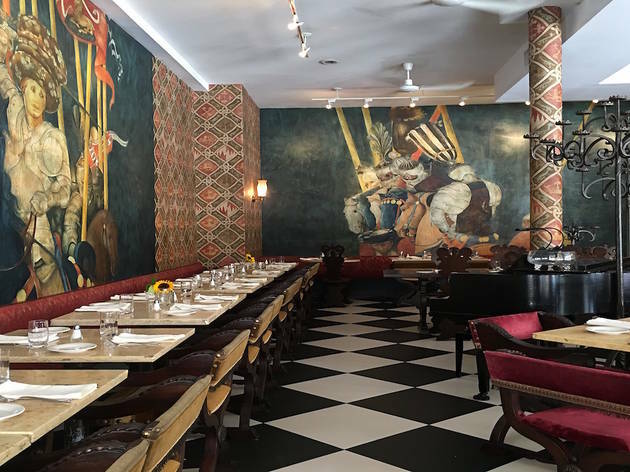 Trattoria Machiavelli’s space sweeps you off noisy Columbus Avenue and into Renaissance Italy, with high ceilings, heavy wooden tables, large black and white floor tiles and cross-frame chairs with pillows, not to mention sidewalk seating. Chef Gian Pietro Ferro (Fiorella, Osteria al Doge) offers up classic Italian cuisine, even producing handmade fresh pasta on-site. The menu is so extensive, with sections for carne, pesce, pasta, risotto and pizza, plus appetizers and daily specials, one wonders how the kitchen manages it all. The wine list is similarly infinite, featuring a wide range of Italian options such as a purple, tannins-heavy 2011 Montepulciano d’Abruzzo from Cerulli Spinozzi. The fritto misto ($13.95) is a pile of crispy shrimp, calamari and show-stealing, buttery baby scallops, plus carrot and zucchini slices. The carpaccio di manzo ($16.95) is delicately arranged like flower petals on a plate, topped with arugula, fennel, shavings of grana padano and truffle oil lightly coating the thinly sliced beef. The ravioli of the cacio e mele con stufato d'agnello ($25.95) is loaded with ricotta, although it’s hard to detect the presence of the apple, and lamb ragù is spooned on top. The risotto vecchia Milano ($23.95) is pooled on a plate, wealthy with sweet fennel sausage and saffron. Unfortunately, neither dish arrives particularly hot. Skip dessert and instead sip a digestif: The torta della nonna ($10.95),a traditional pastry filled with cream and layered with pine nuts and powdered sugar, tastes like a block of perfume, and the chocolate pyramid ($11.95) is swathed in a bitter Hershey’s-like syrup. Throughout the evening, a musician from the nearby Mannes School of Music plays soft acoustic tunes. 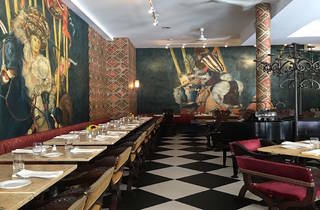 Combining delightful decor and authentic dishes, Trattoria Machiavelli is a true Italian respite on the Upper West Side. Machiavelli is one of our favorite restaurants. It is absolutely gorgeous, yet friendly, unpretentious and family-friendly. I have spent time in Italy and the food is truly authentic and fabulous, especially the hand-made pastas. Beautiful space and amazing musical events!